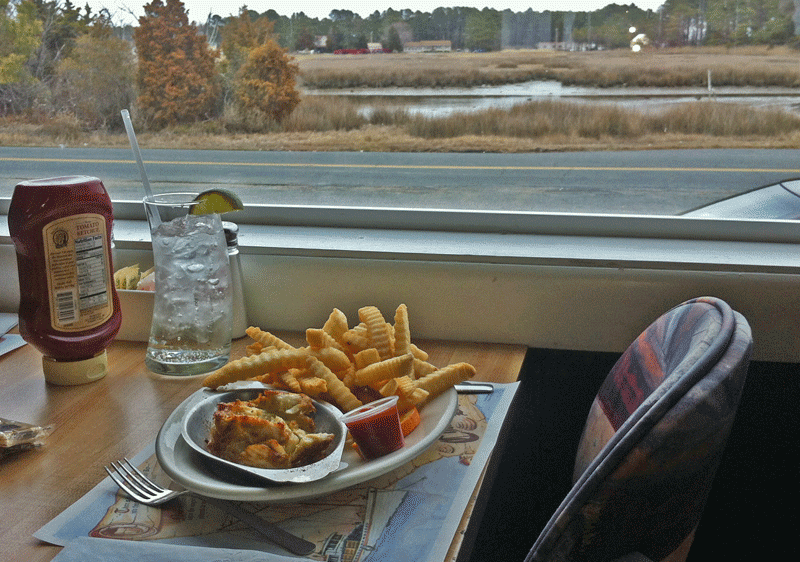 If you’re looking for the perfect crab cake, the Eastern Shore is a good place to start. What makes the difference between a great crab cake and an ordinary crab cake? Being a life-long Marylander who’s lived near the Chesapeake Bay all my life, I’ve stopped ordering crab cakes at restaurants that aren’t in the Chesapeake Bay watershed. I’m always disappointed. After interviewing Jack Brooks, President of J.M. Clayton Seafood in Cambridge, Maryland, I understand that disappointment better. Those other crab cakes aren’t made with 100% Chesapeake Blue Crab. A perfect crab cake will be made with jumbo lump crabmeat from the back fin. It will have little filler – just enough to hold the meat together. The meat will not be overpowered by too many spices or tangy sauce. Most importantly, the perfect crab cake will be made with 100% Chesapeake blue crab. It’s rare to find a restaurant that will exclusively use Chesapeake Blue. The price differential between Chesapeake crabmeat and imported crabmeat is almost 2 to 1. Off-season it’s easier to get fresh crabmeat picked in Louisiana or North Carolina where the season is year-round rather than buy pasteurized Chesapeake Blue. The seafood dealers and restauranteurs are betting their customers can’t taste the difference. Many fine restaurants will start with the Chesapeake Blue, but then mix it with the imported crab meat to stretch the good stuff and save on costs. Lots of restaurants and seafood dealers will use phrases like “Maryland Crabmeat” and “locally picked.” They’re not actually lying. But how much of the total crabmeat mix is authentic Chesapeake Blue and how much is imported or non-Chesapeake? The Chesapeake label on crabmeat is so desirable that some of our local Chesapeake seafood processors have found forged cans in local stores – that is cans with their labels on, market “Maryland Crabmeat” but filled with Asian or South American crabmeat. Everyone wants to tout the Chesapeake name. The Chesapeake Bay is the largest estuary in North America, and it’s a soupy mix of fresh and salt water, nutrients, plants and shellfish give this brackish water a unique composition. Stand at the shore of the Chesapeake Bay or one of its tributaries and pull back a pile of seaweed. You’ll get hit with the smell of the Chesapeake. There’s nothing like it in the world. Those smells generate a flavor in our shellfish that is unmatched anywhere. And when you taste a Chesapeake blue crab, it has a pungent flavor that other crabs don’t have. The Chesapeake Bay Blue Crab is the northern most blue crab in the USA, and because the waters get so cold in the winter, the crabs hibernate. In order to endure hibernation the crabs build up fat (the mustard you see when you open a steamed crab is the fat). That mustard / fat absorbs all those flavors of the Chesapeake Bay. During the winter sleep, that flavors in that fat seeps into the crab meat. If a crab lives a few years, the flavors get stronger. There are chefs who harvest that fat from Chesapeake crabs to use in sauces and marinades just for the flavor. The fat also gives the meat a yellow tinge, so beware when buying crabmeat that’s bright white. It’s likely not Chesapeake Blue. There’s nothing quite like pulling a hot lump of back fin meat out of a steamed Chesapeake blue crab. That punch of flavor has all the smells of the Bay. It hits your taste buds like confetti poppers on New Year’s Eve. There’s a party going on in your mouth. WHAT ABOUT THE OFF-SEASON? HOW CAN WE GET CHESAPEAKE BLUE? 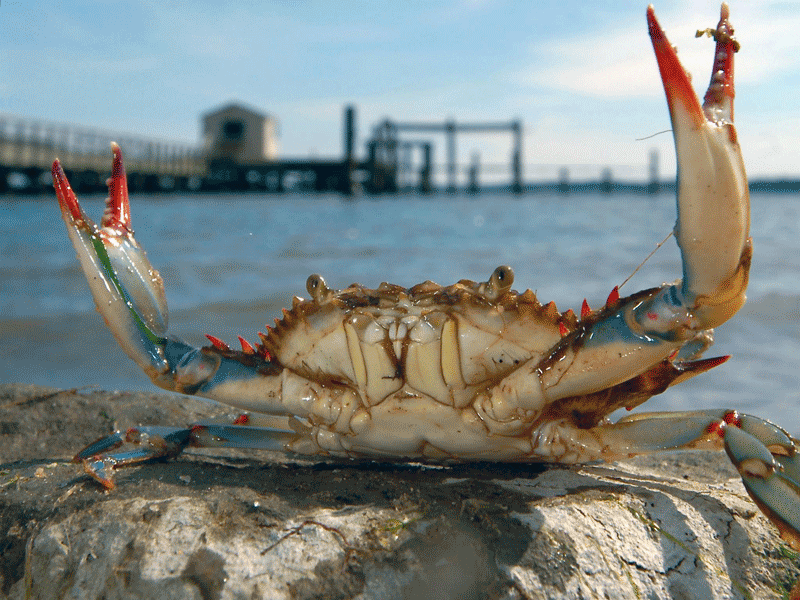 About 80% of the crab processing plants in Maryland are located in lower Dorchester County. Some of these plants pasteurize the crabmeat, preserving it by heating it then freezing it in liquid nitrogen almost instantly. This minimizes bacteria growth, adds no preservatives and keeps that Chesapeake flavor. The meat can be stored for up to 18 months and when it is thawed (2 days in the refrigerator), the flavor is very close to when the meat was freshly picked. The pasteurized crab meat is a little more expensive, but Chesapeake blue crab meat is available in the off-season for those who want to pay for it. 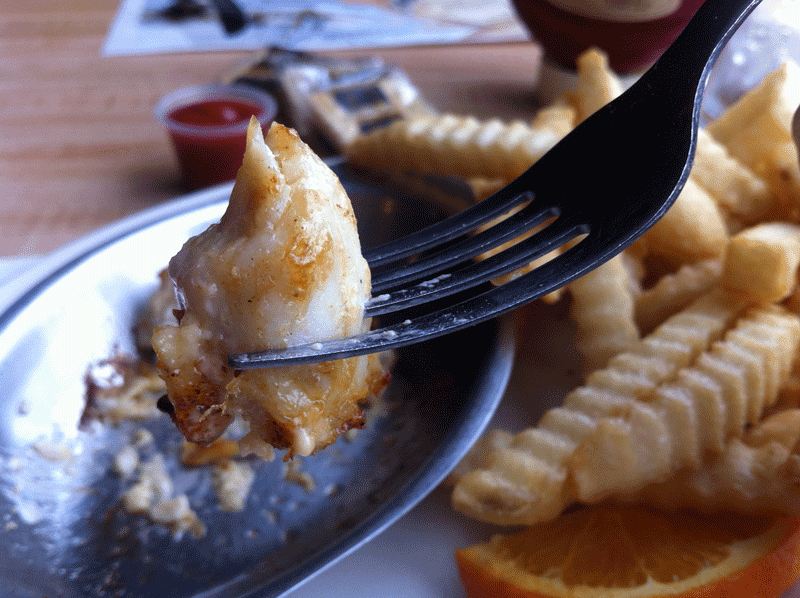 I’ve already written in previous posts that Old Salty’s on Hooper’s Island has the best crab cake I’ve ever tasted – make that the best crab cake I ever tasted since The Captain’s Galley closed in Crisfield. . While preparing for this post I returned to Old Salty’s to get some new photo images. I placed my order and set up my camera and equipment. I was still preparing the setting when my crab cake arrived. While focusing on adjusting the tripod, I took a bite of the crab cake. So for all of you who are happy with smashed down patties of crab meat full of filler and spices and tasteless crabmeat … don’t go to Old Salty’s, or Suicide Bridge, or Fisherman’s Inn or Cantler’s. You’ll never be the same. And the one thing lifts these places far above their competitors is that they use 100% Chesapeake blue crab meat and the taste proves it. I still think Old Salty’s has the best recipe, though. Perfect finish to a crab cake meal. 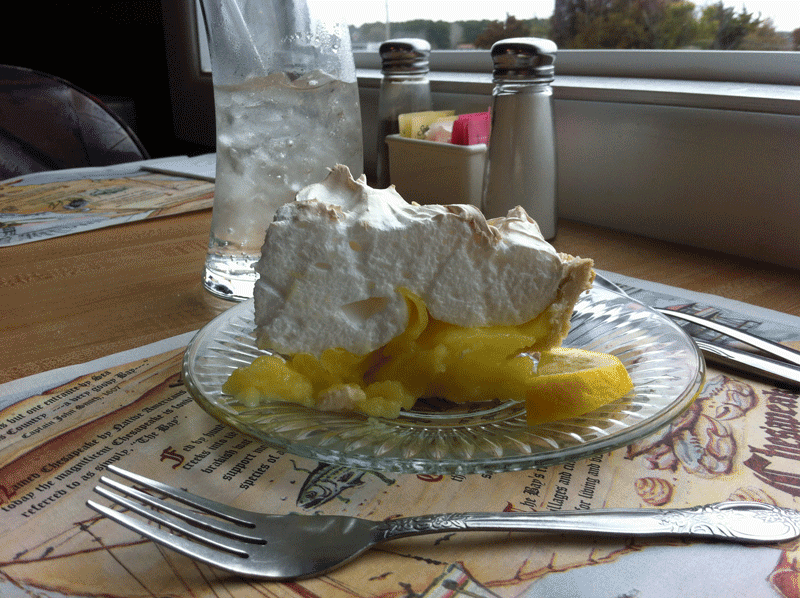 Try the lemon pie at Old Salty’s. 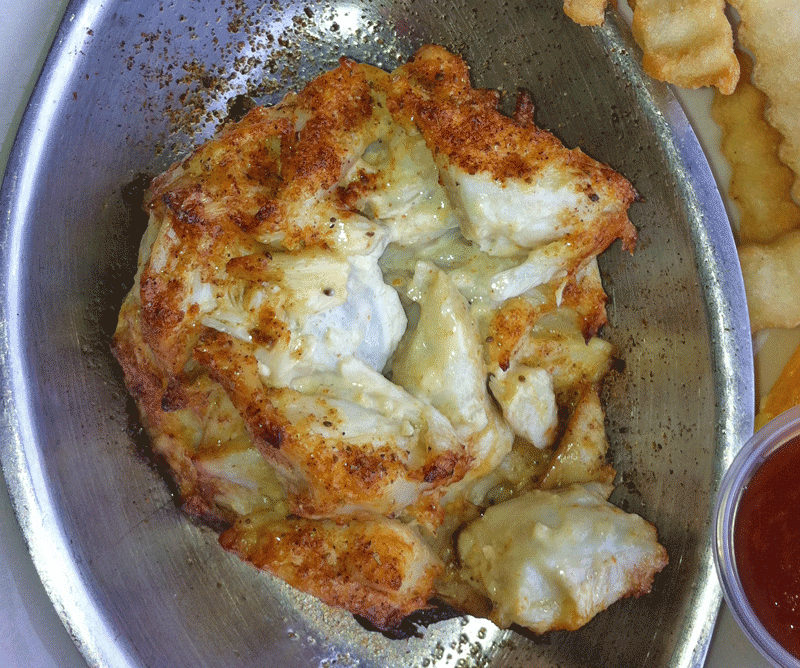 NEXT TIME YOU HAVE A CRAB CAKE OR DIVE INTO A PILE OF STEAMED CRABS …. Check to see if you can taste the Chesapeake. What are your favorite places to eat crab cakes? Is Your Maryland Crab Cake True Blue? – website by MD DNR showing places that serve Maryland crabs and Maryland crabmeat. Blue Crab Facts – things you never knew about the blue crab. National Hard Crab Derby – Yes these are crab races where hundreds compete for a Governor’s Cup and more. Place crabmeat in a bowl and sort through for extraneous shell. Avoid breaking the lumps. Add the rest of the ingredients, except the vegetable oil, and blend together gently with a 2-pronged fork. Heat the oil in a skillet (one inch of oil). Use ice cream scoop to form and remove the crab cakes from the bowl. Fry a skillet full of crab cakes in the oil until golden brown on one side. Turn and fry on the other side for one minute or until golden. Remove and drain on paper towels. – 8 to 10 crab cakes. Whisk egg, mayonnaise, mustard, Tabasco, Old Bay, salt and pepper. Then add crabmeat, parsley and crackers. Toss lightly but well. Makes about 8 (1/2 inch thick) patties. Refrigerate 1 hour, fry in oil or butter 1/2 of each for 5 minutes each side until brown and crispy. Beat eggs. Add parsley flakes, Old Bay seasoning, mustards, Worcestershire sauce, lemon juice, salt and pepper. Combine with crabmeat and Miracle Ship. Shape into 12 balls and roll in cracker crumbs. Fry in oil or broil in 375 oven for 20 minutes. Serves 6. #11 Avalon Theater - See a Show, Find the Ghosts. Have you tried Palm Beach Willie’s near Tayllors Island?